Last October, Huawei CEO Richard Yu revealed that the company has a working foldable phone that could be released in 2018. The timing of that comment is important, because just one month prior to Yu's statement Huawei filed a patent application with the World Intellectual Property Organization (WIPO). The patent was published today by that organization, and includes images of what Huawei has in mind. In the open position, the foldable Huawei device is a full-sized tablet. It appears to fold in the middle to become a smartphone. Back in October, when he discussed the foldable phone that Huawei was working on, CEO Yu mentioned that there was a "small gap" between the two screens when they are opened in the tablet position. At the time, he said that Huawei had to find a way to get rid of the gap. Since this patent was filed before his comments were made, we assume that the mechanism in this patent does not solve that issue. 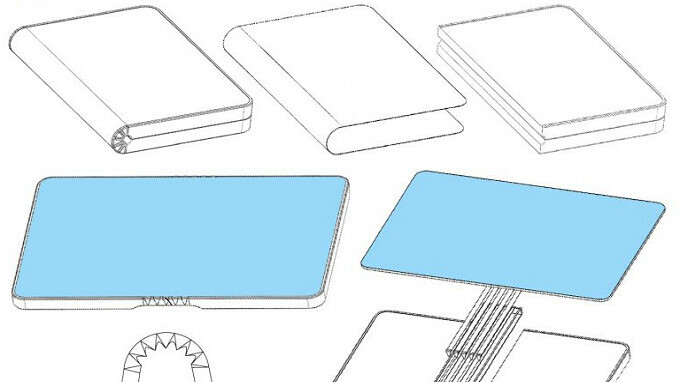 Other phone manufacturers are believed to be working on a foldable phone. Earlier this month, a Merrill Lynch analyst said that Apple is creating a folding iPhone that could be introduced in 2020. Microsoft has received some patents for its "Andromeda" foldable device, and Samsung is reportedly set to unveil the long-awaited foldable Galaxy X some time next year. You can see images from Huawei's patent at the very top of this story. Competition is fine but I feel like everyone's suddenly going to rush because there are too many compagnies working on this. Eliminating the gap is an easy proposition. The issue is the hideous double-action hinge that would be required. Folding phone that turns in tablet and vice versa *gasp* shock! Really nothing original? Well, Lenovo's concept/ prototype foldable phone that could be wear on the wrist was a little bit original! Huawei first to show us their foldable display technology! Not like Apple just to patent something that others innovate, so to say 'we invented it too' , when real tech companies make it and want Apple to pay them if wanna copy. And did you know that apple and samsung done it already?https://9to5mac.com/2017/11/23/foldable-iphone-patent/https://www.techradar.com/news/samsung-galaxy-x-the-story-of-samsungs-foldable-phone-so-far So who cares about these patents anyway if they have no working prototype or a released product? Whatever, but: Apple and Huawei doesn't have 'this foldable technology' , so it must be forbidden to them to fill those BS patents. Right? It looks like a notebook when folded and the hinges remind me of the surface book. Neat concept. Rollable tablets? If it isn't floppy but rather solid in tablet mode it's nice. Otherwise just make rollable monitors and such.